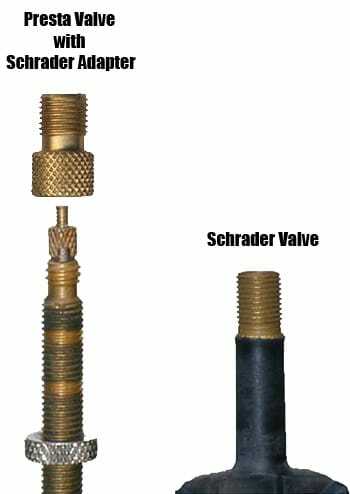 Chances are if you are reading this page you are trying to learn what the difference is between SCHRADER VALVES and PRESTA VALVES! 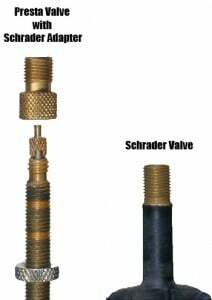 SCHRADER VALVES are what you are most familiar with. Schrader valves are on your car tires. They are large and durable. In the cycling world they tend to show up on inexpensive department store bikes, kids bikes and some mountain bikes. In fact some ill advised and unwitting mountain bike riders despise the the PRESTA VALVE so much that they drill out the rims of their bikes to accept SCHRADER VALVES. This is a bad thing. There are a few negatives to SCHRADER VALVES. The biggest negative is the Schrader requires a larger hole in your wheel/rim. This can result in rim breakage. The next negative is there is nothing to prevent the SCHRADER VALVES from being pressed in to the tube and possibly causing a puncture (Presta Valves use a locknut). The next negative is weight. In high end racing road bikes where every gram of weight matters SCHRADER VALVES are taboo. The final negative is that it is possible for the valve stem to be slit in the are where the stem exits the rim. I have read that SCHRADER VALVES are designed for low pressure applications like car tires. I cannot confirm this. PRESTA VALVES are are smaller in diameter than SCHRADER VALVES. They feature threaded valve stems, a lock nut for the valve core and are secured to the rim with a lock nut. Unlike the SCHRADER VALVE the PRESTA VALVE properly installed in the rim and under normal circumstances is not capable of damaging the tube or susceptible to being cut. The lock nut on the valve core serves two purposes. The first and most obvious is to lock and seal the valve. The other less obvious reason is to aid in accurate deflation by limiting the distance the core can travel. The downside of the PRESTA VALVE is it can be somewhat delicate especially when using inexpensive tire pumps, tire pumps with poor chucks and or poor handling. Folks tend to break the little threaded stud that holds the lock nut. 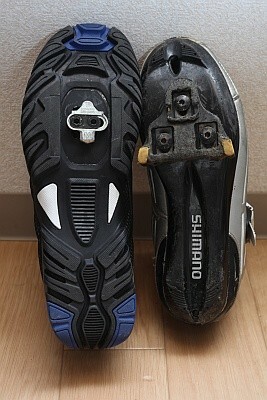 This is also a reason why riders should always keep the protective caps on the PRESTA VALVE. Schrader Valves vs Presta Valves Conclusion – The Presta valve is superior for bicycles. Presta Valves are lighter. The Presta Valves smaller diameter equates to a stronger and stiffer rim or wheel. Installed properly a Presta Valve will not be pushed in to a tire tube. Another strike against Shrader valves (and I think a more important one) is that they’re larger. They require a wider diameter hole be drilled through the rim, which can compromise its strength.